This event has since ended. We hope you were able to join us. Updated 8/18/2017 to include additional parking information. The United States Air Force Thunderbirds will return to the Dover skies August 26-27, 2017, 9 a.m.–4 p.m. for the Thunder Over Dover: 2017 Dover AFB Open House. This event is open to the public with free admission! Help celebrate our heritage at this open house as Dover AFB will be celebrating its 75th Anniversary, the U.S. Air Force’s 70th Anniversary, and the City of Dover’s 300th Anniversary! Please visit the official Dover AFB Open House page for the latest information. Demonstrations and acts are subject to change. Parking an RV or a bus at the AMC Museum during the Open House is severely limited to the first five vehicles. Unfortunately, this is a first-come, first-served situation and once filled no further RV or bus parking will be available. Parking for RVs or buses will not be available outside of the AMC Museum for the Open House. If you are parked at the AMC Museum, your vehicle must be moved no later than 5 p.m. each day. There will be no overnight parking available. We apologize for the inconvenience. Car parking will be available at the AMC Museum; however, spaces are limited. There will be no overnight parking available. Visitors arriving to the Open House from the south will be parking at Bergold’s Farm. Please follow the signs on Route 9. Once parked, visitors will be shuttled to either the AMC Museum or Dover AFB’s main ramp where the Open House will be held. Visitors arriving to the Open House from the north will be parking at the DAFB ramp. You may enter the base through the north gate entrance and will be directed to the ramp to park your car. You will need to pass through a security checkpoint to gain access to the Open House. Base access from the AMC Museum and Bergold Farm include a security checkpoint and a shuttle bus to move you from your location. These shuttle buses will be running all day for your convenience. If you’ve parked your car at the DAFB flight line, you may take a shuttle bus to the AMC Museum. Please understand that this is a Dover Air Force Base event and that the AMC Museum cannot answer questions you may have regarding the Open House. If you do have a question, you may contact Dawne Nickerson-Banez, Community Relations at the Base Public Affair office, at 677-6575. 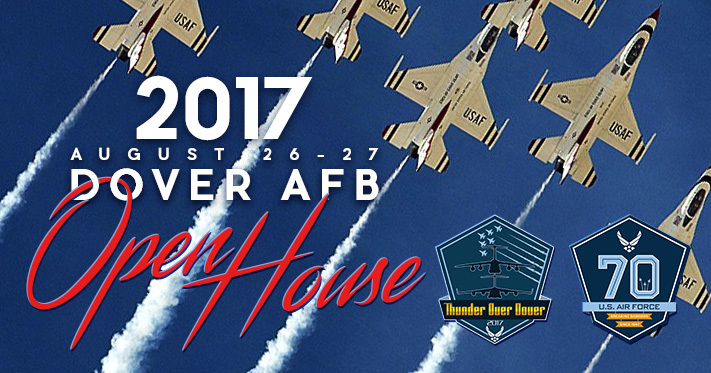 Check out the base’s Thunder Over Dover page for any additional information regarding the Open House. The museum’s August 19th Open Cockpit Day event will be rolled into the open house on the 26th and 27th. What time will the Thunderbirds perform each day? The Thunderbirds are the last act for each day, so a little after 3 p.m.